Mark Twain once said: “Don’t let the truth get in the way of a good story.” Words that Hollywood has lived by since the invention of cinema. You always have to be aware of the dramatization of actual events when it comes to their depictions in the movies (or whatever other form of entertainment). It turns out director Ben Affleck has taken this sensibility to heart with his new movie Argo, which is based on the actual events surrounding a hostage situation that took place in 1980 Iran 1980 involving American citizens with a few twists and turns added to the story for extra impact. Argo tells the story of an incredibly daring mission to get a number of Americans out of Iran by pretending to produce a science fiction movie. Affleck plays Tony Mendez, a CIA operative who comes up with the actual plan, which is just slightly more feasible than the original CIA plan, which involved bicycles. Tony enlists the help from visual effects genius John Chambers (John Goodman) and washed-up producer Lester Siegel (Alan Arkin) to create a believable fake movie production. Mendez goes to Iran with all of his movie stuff to make contact with the six Americans and make sure they get out safe. How he does that I am not going to tell you, of course. There is a fine line between exploitation or adding and using content to ‘complete’ a story. Screenwriter Chris Terrio found a balance between the truth and fiction that feels seemless. 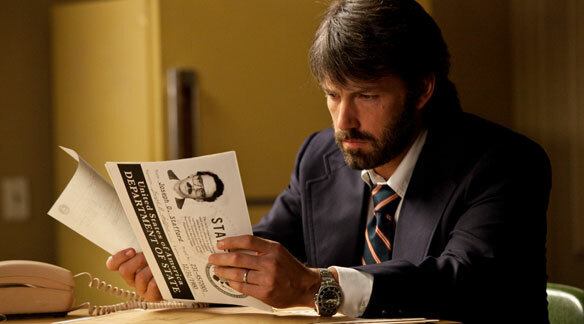 A lot of what happens in Argo is true and it feels like it. At the end of the movie there is a montage composed of photos from the actual events compared to stills from the movie. The attention to detail is astonishing and is sure to nab some Oscar nominations next year. When it comes to the happenings in Iran the movie is dead serious. There is no joking around here when it comes to the actual kidnapping of the Americans and the escape of the six others. The fact that Argo has been called a comedy is therefore ludicrous to me. That doesn’t mean Argo isn’t funny, on the contrary. But the funny stuff happens primarily on American soil, at home. The scenes with Goodman and Arkin are nothing short of hilarious. These guys know the business they are portraying by heart and aren’t afraid to take a piss at it. Great stuff from two great actors. Argo is actually the perfect movie to display the power of cinema. The mission in the movie centered around the production of a movie, a fake one, which shows that cinema has the power to create fantasies even when it isn’t actually a movie. The mere thought of a movie can make people dream (as we see in one of the final scenes). The other way Argo displays the power of cinema is the fact that if you are not up to speed on what actually happened during this mission (like I was) you are most like to not notice the seams where fact and fiction are sewn together. Even when the stakes become very high and the movie veers a little bit too much into Hollywood territory, you still think that this could be the truth, because the rest was so truthful (which it sometimes wasn’t). I believe Argo is one of the best movies to display this power in several ways and it is a damn fine thriller on top of all that. This entry was posted in Drama, History, Thriller and tagged Alan Arkin, Ben Affleck, Bryan Cranston, Chris Messina, Clea DuVall, John Goodman, Victor Garber by mymovieyear2012. Bookmark the permalink.